Gift card sales have risen to over $130 billion annually and they continue to grow each year. Large retailers have taken advantage of this trend, and now, with our cost effective, turnkey programs, smaller merchants can too! Our gift card and customer loyalty programs are designed to promote your business by increasing store traffic and encouraging customers to keep coming back. These cards are like "mini billboards" inside your customer's wallet, reminding them to visit your business rather than another retailer. "Rewarding customers is one way smart retailers keep customers coming back." 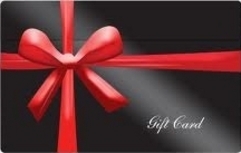 Gift cards are a powerful promotional tool! Our gift cards look and act like credit cards except they have your store name and logo on them! Choose from one of our predesigned templates or design your own unique card. A gift card can be purchased for any amount. You collect the funds upfront and simply activate the card. When the gift card recipient returns to your store to purchase goods or services, swipe the card through your POS equipment to deduct the amount of the purchase. Cards can be reactivated and funds can be added at any time. Our robust reporting features allow you to track cards and evaluate the effectiveness of your marketing programs. Creative Rewards programs generate repeat business! Our Loyalty Program gives you the ability to track and reward loyal customers. Research shows it costs up to eight times more to acquire a new customer than to keep an existing customer coming back. Yet many merchants continue to overspend on campaigns to attract new business and underspend on building value with the customers they already have.